Let me start by wishing you all a very Happy New Year...I hope it is a blessing year for all of us. I am not going to add much words here but let the pictures do the talking..heh! The holiday was great as I was completely free from work. It weather here has now really really dipped down and is quite chilly.....but it is the right time to have a bornfire. 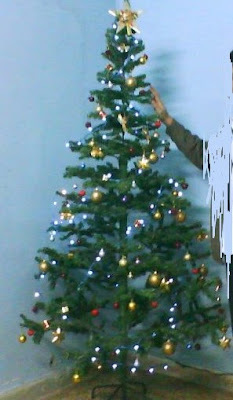 This is the Christmas Tree. I know it's not the best tree in the world (:D) but I really love and enjoy decorating it. I did not do it alone, of course. And I removed the model here as I have not consulted him whether he allow his picture to be included or not...lol. One of my sisters sent some money so that we can enjoy smoked meat. So, we went to INA Market and bought 3kgs of pork which we smoked outside our house. It was one of the best smoked-pork that I ever had. I am not sure whether my friends enjoyed it as much as I do but I know that none of them complain about it. I took this on 31st Dec and so I simply added it. New Year's Eve near Kamal. Whenever I came here, the place remined me of my dear dear friend, Kima and I am sure he has the explanation..hehe. We went to pick up one of our friends at Kamal who joined us for the night. When we reached this place, it was full of life..or call it "very happenning". The stuffs in front of the man with green apron are fried chicken...the chest, the legs etc. So, whenever any one of the cooks finished his share, he simply pour it in front of him. Then the man with the green appron weigh it the weighing scale, commonly known as patla or padla. In between, he fried his share on the big pan on his right side. It was real fun to watch this activity. New Year at Mizoram House, Vasant Vihar, New Delhi. I was behind the camera..these kids are funny. New Year's Night at Mizoram House. Believe it or not, I was there and I had a good time. Ok, I was here not because of my own will but because of my nephew and other friends who wanted to sing so badly. Therefore, I have no choice but to join them. However, I did not regret it. In fact, I was quite thankful that I was there. Praise the Lord. Hello, Happy New Year! Looks like you had a good time over the hols. And I see your talents extend to smoking pork as well. Hmmm! Sa lamah tran I va la nasa ve unaunu lol Tui hmel hlawm hle mai! Eh!! Khi in va hman nawm hmel ve..
Broiler ar hi kan hem hmin thrin a a tui ve phian!! Mizoram house a lam rui awm zan te khan i inkhawm ve a ni maw?